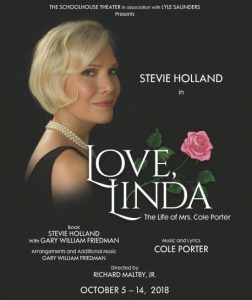 Love Linda, The Life of Mrs. Cole Porter, What is this Thing called Love? | Limited Engagement. The Schoolhouse Theater presents LOVE LINDA, the Life of Mrs. Cole Porter, What is this Thing called Love? a celebration of the enduring legacy of the Cole Porter songbook. The one-woman tour de force, directed by Tony-Award-winning director Richard Maltby, Jr. and starring acclaimed jazz vocalist Stevie Holland, enjoyed a highly successful Off-Broadway run 2013-2014 and now comes to the Schoolhouse Theater for a very special limited engagement. The score for LOVE LINDA includes such beloved Cole Porter songs as “Night and Day,” “I Love Paris in the Night,” and “Love for Sale.” These and other Porter songs tell the story of Linda Lee Thomas, a Southern beauty who married and became the muse and inspiration behind the legendary songwriter. Though Mr. Porter was gay, their couple’s companionship, devotion and love lasted through 35 years of marriage.